Is this going to replace XSane in Lucid? xsane was a good program, but i really think for new users it was far too complex, be it interface, logo, or the kinda confusing name. As Simple Scan aims to be simple, would it be possible to add plugin support? This way, external people would be able to add features which are anything but "simple". I'm thinking of preview zooming, document types editing (like profiles), output choosing (fax, ocr, web services). If gnomescan is not developed anymore, wouldn't be better to stay with sane? Installing now, I'm excited to try it out! installed simple-scan in Ubuntu Karmic thanks to your PPA. Thank your for making Simple Scan, I have used XSane and I think this looks better. The buttons and so on are easy to understand and use. The "cut" tool was good. I am scanning all the mail for my brother that have moved out of the country(cus studies), on a LAN scanner(Brother DCP-6690CW). Simple Scan works fine for the first scan, but when I press "new" and try to scan again it stops(showing the working icon). I have to close the program to scan again(have tried several times). I do not have this problem in XSane. I miss a cancel button. The program should also warn you when closing the app when you have not saved the work. Simple Scan is new and looking good; I hope it get fixed when Lucid comes out. 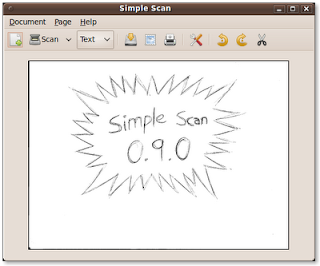 I tried SimpleScan on Ubuntu 9.10 and I didn't like it. I prefer gscan2pdf. gscan2pdf could save the documents in djvu format. Also I'm ablo to configure some necessary scanner settings. I think your multi-page scanning problem is fixed, please try 0.9.2. Nifty! Thank you for your answer! I like Simple Scan too, hope to see better PDF-support/quality in coming updates! Nice to be able to use my Samsung SCX-4521F scanner on Linux now. Simple Scan is perfect for basic document scanning.